This blog is late in coming so run to FineSmith to get this fabulously mod outifit. It is called Shiraz and there’s also a Shiraz clutch AND jewelry (necklace and earrings). TRPH5 Hunt Prizes! More! More! More! More goodies waiting for you to find at the 5th The Runway Perfect Hunt! Moondance: necklace, earrings, bracelets, rings, AND nails! It’s as if these designers got together and planned out what they were going to offer as hunt prizes — but I don’t think they did! Romance Couture has the Solde 2-way dress as a hunt prize. Named after one of the best people in SL, who can resist!? Dress comes in two parts from MEB: Dolcevita Camu top and Mo Skirt Summer! From Morgane’s Poses: one of the poses in the hunt prize set! The hunt starts in April. Stay tuned for SLurls, LM’s, Notices, and all sorts of info coming your way! This is the sweet spring-y Alma dress from Aly’s Shop and is one of the hunt prizes. Comes with the butterflies AND shoes! TRPH5 begins on April 1st and goes through April 15th. SL photographers of VISIONAIRE INSTITUTE have recognized that there is a lack of a common terminology regarding the treatment of an SL photograph. This becomes a difficulty for many who require photographs yet do not have the language to request the type of photo they have in mind. This can lead to problematic situations that could be avoided with the proper common language. Below are definitions of four common TREATMENTS (as opposed to intended use) of SL photographs. Each of the categories is on a continuum with no strictly defined parameters, and a photograph may well straddle two or more categories. These are general definitions that can help form a common ground of understanding. No particular treatment of SL photographs is “superior” as all treatments have their uses. As artists, SL Photographers are evolving, innovating and exploring all the time as well as influencing one another. A Raw Unedited photo or Unedited Snapshot is not a low quality image. It is an image that is not post-processed in any way other than cropping, resizing or adding a watermark. Such a photo allows the small, minor imperfections from the viewers (ie. jaggedness at curved body parts like elbows or the chin). Windlight, picture quality and overall composition is still of significant importance. Heavily Enhanced photos add further treatments. Extra hair, lashes and even background can be added using any image editing software. Often in heavily enhanced photos the avatar may be distorted to fit the mood of the image. It is at the discretion of the photographer how much and what is to be added to the image. It is also possible for a photographer to add certain PS brushes or effects (ie. lens flares, enhanced shadows) not created using the viewer’s windlight capabilities. A black and white image will generally be in this category because of the desaturation that must be used. Pile-up images will generally fall into this category or the next one. A simple way to recognize an image from this category is by the amount of post-process “painting” or “photo-manipulation” done to enhance the image and its quality. Artistically Painted or Manipulated photos may be considered closer to fine art, are beautifully enhanced, pay great attention to composition, and have perfectly re-textured skin and hair. A lot of time and effort is spent on shadowing, burning, and retouching to blend the avatar in with the environment, and photo-manipulating snapshots that are taken from the Second Life Viewers (thank you, Toy for adding this comment!). The image conveys an emotion, creates a scene, or hints at the story (or the lack of one, in some) behind the picture. Many of these images may be done in front of a green screen. We hope these definitions can help clarify communication amongst those requesting SL photographs and those providing them. 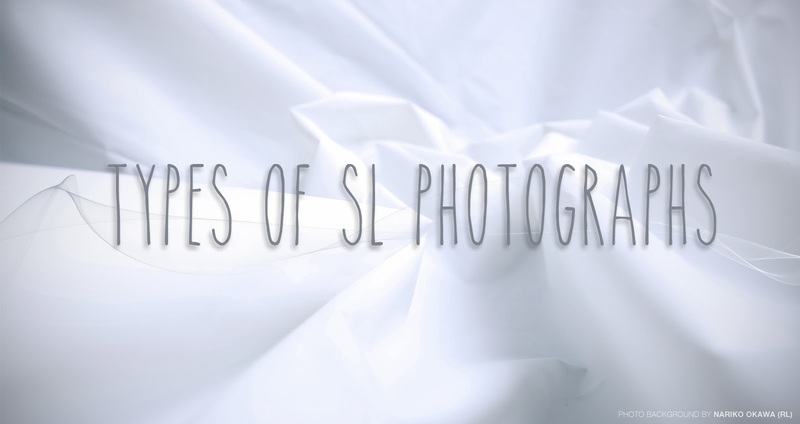 Creators of contests would also benefit from using this terminology when requesting the type of SL photograph they wish contestants to submit. Wishing you many happy hours of gleeful snapping!